I WANT TO DONATE - BUT WHERE? Many times we are ready to gather the items in our home that we no longer need or want but are unsure as to where we can donate them. Some items can be more challenging than others. A local donation site might not take what you have to offer. When you are ready to donate and don't know where, here are a list of suggestions to help you out. Medical Equipment - Many times when I am working with a client who had an elderly relative living with them or is cleaning out that elderly person's home, we come across medical equipment that is no longer needed. https://www.med-eq.org/Donate/ . Med-Eq matches donors with charities that need what the donors are offering. You fill out a simple form online and the staff at Med-Eq will choose a recipient. The receiving party covers any costs such as mailing expenses for smaller items or arrangements are made for pick-up right from your home. Wigs - There is a wig exchange program which provides free wigs to women experiencing hair loss due to chemotherapy. The EBeauty Community can be found at https://www.ebeauty.com/donate-a-wig/. Musical Instruments - Instruments in the Cloud is a non-profit organization that allows donors to connect with local teachers who are looking for instruments. http://www.instrumentsinthecloud.org/donations/new. For more information, go to http://www.instrumentsinthecloud.org/pages/faqs. Lastly, in honor of Veterans Day this month, Operation Gratitude sends care packages to deployed troops, and all those care packages, including Beanie Babies or other small plush toys, as well as gently used ones, are accepted. https://opgrat.wordpress.com/2013/06/09/beanie-babies-for-the-troops/. There are other ways to donate as well, so take some time to review their site. So, the next time you are in the midst of decluttering and stuck on how to donate certain items, refer back to this list. As always, I am here to help you create A Better Space. Is your home starting to look like an episode of "Hoarders"? Perhaps not, but it might be time to get rid of the clutter and get organized. You have three choices - throw it away, donate it or sell it. Which one do you choose? Toss It - Get rid of old receipts and any paperwork that is no longer needed. For confidential information, be sure to use a cross-cut paper shredder. Throw away anything that is broken and you have no intention of fixing or cannot be fixed. Eliminate expired food in your pantry, refrigerator, freezer or kitchen cabinets. Toss old make-up and other cosmetics that are past their prime. Check with your county or municipality to visit Earth911.com to locate a facility where you can drop off automotive and home-improvement items such as oil-based paints and, pesticides for proper disposal. Sell It - Some of your items can find a second home and get you some cash in the process! Utilize E-bay, Craigslist, consignment shops or specialty sites for books, clothing and tech items. For books, log on to Bookscouter.com, enter the ISBN number (located over the bar code) and receive price quote from online booksellers who want them. Sell your designer clothing and accesories at The Snob (www.thesnob.biz) and Snobswap (www.snobswap.com). For vintage clothing, try Etsy (www.etsy.com) and Fashiondig (www.fashiondig.com). Have a yard sale! Donate - Get that warm, fuzzy feeling and even a tax deduction by donating your things to charity. 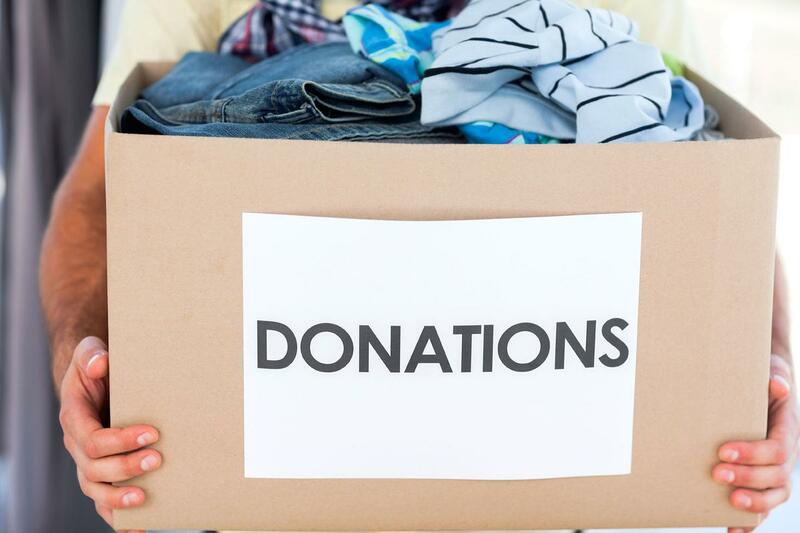 Whether you donate to a local non-profit such as Goodwill, Salvation Army or other local thrift stores, it is easy to eliminate your items from your home quickly. You can either drop off the items at the site or have a truck come pick them up, depending on who you choose. Purple Heart and other veterans organization are also a good choice. Always check with whomever you choose to be sure that they accept the items you have to donate and be sure to get a receipt to use when preparing your annual tax return. When it comes to electronicss, be sure to erase personal information. Erase the SD car, SIM card or destroy the hard-drive. Donate your old cell phones through Verizon's HopeLine program for victims of domestic violence or support the troops overseas at CellPhonesforSoldiers.com. Donate your shoes to Soles4Souls.org and books to your local library. Senior centers and day-cares need arts and crafts. Animal shelters needs towels, blankets and sheets. There are so many choices. When it comes to eliminating your clutter and getting organized, you have three choices. Toss, Sell or Donate. When it comes to getting help if you are overwhelmed, consider using a professional organizer such as myself, to help you get the job done! Together we can eliminate the clutter and create A Better Space for the things you wish to keep. NEW YEARS RESOLUTION - ORGANIZE THOSE CRAFTS! Now that we have put away the holiday decorations, it's time to focus on some of those New Years resolutions. A common resolution is to organize your crafts. You enjoy all your crafts but they are stored haphazardly throughout your home. They are in the family room, they are on the dining room table, they are all over the floor in the basement, they are in a pile on the kitchen counter. It's time to get it together and get them organized! If you find that you are taking too much time to find the necessary materials and it's affecting your craft-making abilities, it's time to focus your creative energy towards a designated craft room. Keeping your craft supplies organized will save you lots of time - more time to create, less time to locate what you need. Whether you're into card making, scrap booking or any other type of craft, you'll have more time for the things you love when they are organized. First rule is to keep all of your supplies and materials in one area of your home, and stick to it! Look around your home. Select a space that will provide you with sufficient storage space, space to work and, if need be, the ability to watch of your child as you work. Why not designate a space in the playroom? This will keep both of you busy! If you prefer to have good lighting instead of convenience, set up an area in a well-lighted room. Are you dealing with a small space? Why not turn a standard closet into a craft closet, to keep things tucked away when you're not working. Depending on the situation, you might be able to put a desk space in the closet with storage overhead to create a craft room. If not, consider using a folding table that you can store away when not in use. Be sure to organize by hobby. When you have multiple hobbies (and a lot of creative people do), keep things separated. You can use a different shelf, drawer and/or color-coded container for each craft. Try to keep these different items confined to their assigned areas so they are easy to locate when needed. Make sure to put things back in their designated space when finished working on them at the end of the day to keep them organized and distinquished from other craft projects. Designate a general space in your craft area for items you tend to use in every project - like scissors, glue guns and tape. Store these items in an easy to access area, such as in a drawer or in a box on a shelf over your work space. Think vertically. Look up! Look down! Utilize all of the available space, without overrunning the home with craft supplies. Think about using wall space for vertical shelving, over door space with clear shoe organizers to hold various supplies and even storage under a bed or table. (If it's visible, use a decorative container.) You will be amazed at how much room you can create for your crafts. Be creative! If you want to be mobile, think about using on-the-go storage. A rolling cart will give you the flexibility to take your creative works with you. Be sure to select a portable container that can organize your projects and supplies by compartmentalizing them. Use your imagination to create a place where you can maximize your potential without the distraction of clutter and most importantly, ENJOY! If you need any assistance with this or any other type of organization, please feel free to contact me. I will be more than happy help.